Power adapter & Power splitter. 1-year warranty on DVR, cameras & accessories. 3-year Labor warranty. Life time Technical support. 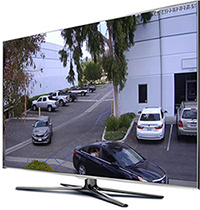 With 1080P HD resolution, you will no long miss any detail happening in your home and office. Ever find network configuration and port forwarding depressing and troublesome? Leave the geeks stuff to tech people and live our life easier. 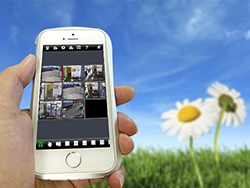 With the newly implemented software, the DVR can be easily accessed from your mobile device in a few seconds. Simply scan the QR code from the Information menu using your mobile phone and enable NAT feature, you will be able to live stream the video footage anywhere around the globe using your mobile device with a peace of mind! The 8CH DVR supports live streaming video or playback on PC, Mac OSX, iPhone, iPad, Android phone and tablet. Users are also able to configure the DVR settings via web browsers such as IE, Firefox on PC or Safari on Mac. Up to 100 channels of live video can be consolidated on 1 screen on PC or Mac through the attached powerful CMS software. 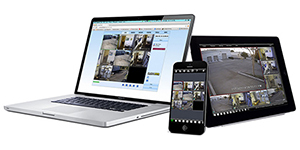 Watch your properties on the go with the SuperLivePro mobile app and the SuperLiveHD tablet app. It is capable of viewing live video feed, playing recorded footage, taking snapshot, controlling PTZ cameras, and switching between multiple DVRs. You can even configure your DVR settings on your mobile phones or tablets! Compatible with iPhone, iPad, Android Phones and Android Tablets. Monitor your precious assets anytime and anywhere. The included A-MHDBF1 indoor / outdoor bullet cameras capture outstanding video day and night. It is equipped with 36 Infrared LEDs to produce superior night vision image up to 90 feet away. These cameras are fully functional under harsh environment. It is designed to be weatherproof and sustainable under extreme temperature and humidity. Built-in HDMI video output allows users to view cameras on high resolution TV up to 1920 x 1080. For users' convenience, the DVR can output video via HDMI, VGA, and/or BNC video output. W11.9" x D10.7" x H2.3"
Copyright 2019 Aposonic. All Rights Reserved.